I’ve recently joined the Great British Chefs Cookbook Club on Facebook. Each month the club will feature a cookery book and encourage members to try featured recipes from the book and then share photos of them. The idea is to expand our repertoires and encourage discussion around these dishes. As an added incentive, the club’s administrators will pick a winner each month from the posted photos who will win a signed copy of that months’ cookbook. Well, a gal can never have too many cookbooks! 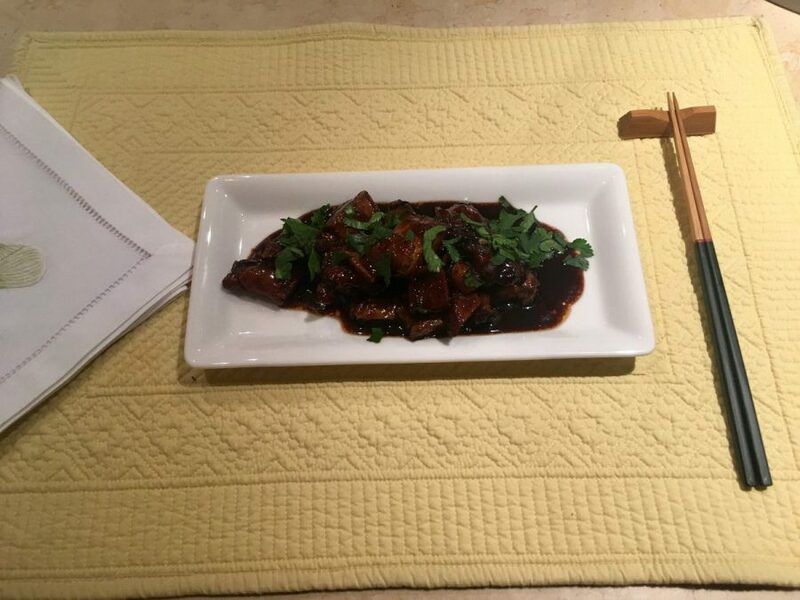 The first cookery book is Hong Kong Diner by Jeremy Pang and I’ve cooked his recipe for Cantonese Pork Chops for my beloved, who’s extremely fond of Chinese food. 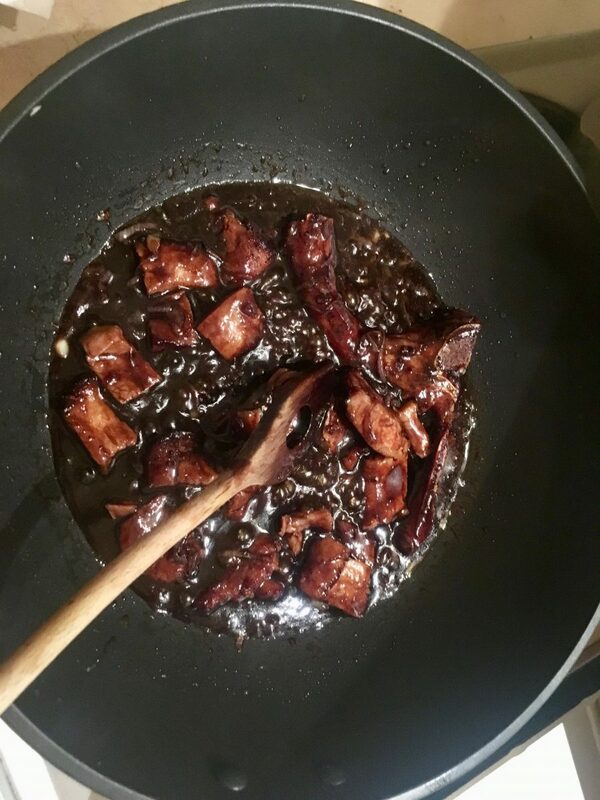 The recipe below is Jeremy’s with a few amendments of my own, only because I didn’t have all of the specified ingredients and, while it didn’t look as good as the pictures in his book – they never do – my beloved said it was sticky, tender and very moreish – mission accomplished! 1. Slice the pork chop meat off each bone in one long sweep, keeping each chop as one whole piece of meat and reserving the bones, as they add flavour to the sauce. 2. Turn your cleaver upside down and, using the blunt end (careful not to hold the blade! 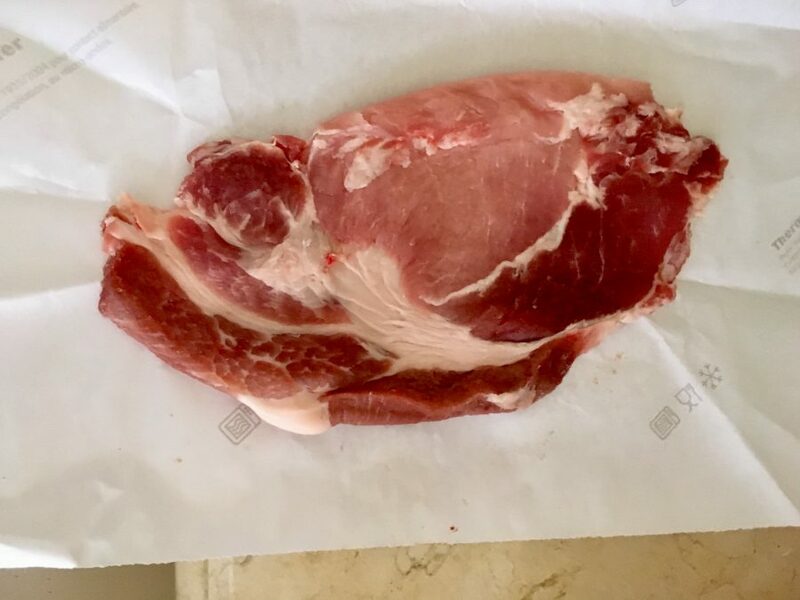 ), bash across the meat as many times as possible to flatten it out, making indentations along the pork and creating as much of a surface area as possible. This will begin to tenderise the chop and allow the marinade to really flavour the meat. I bashed mine with a wooden rolling pin! 3. Keep each pork chop in one large piece at this stage. 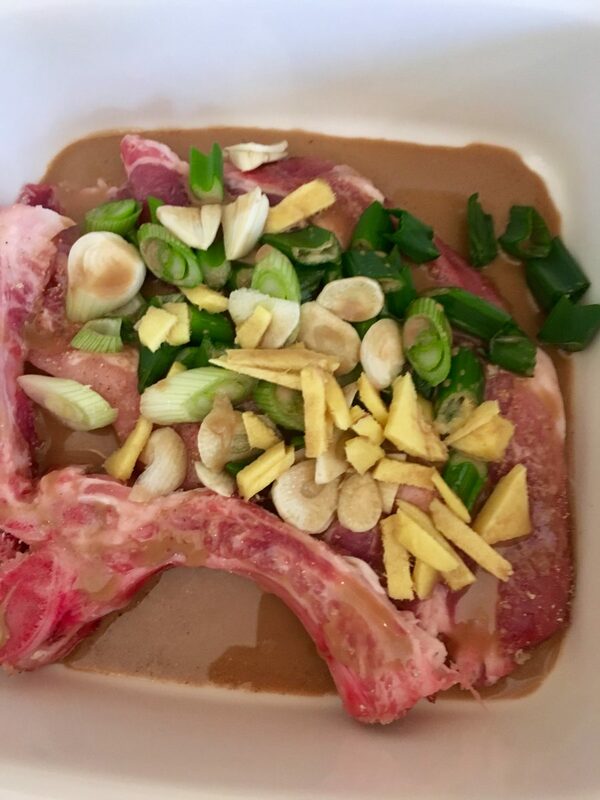 Once the pork is flattened, a similar thickness to an escalope, mix the marinade ingredients in a bowl and massage them into the bashed-out meat and the bones until they are completely coated. Leave to marinate in the fridge, ideally overnight, or for a minimum of 1 hour. 4. When ready to make the dish, finely slice the red onion and set aside. I didn’t have a red onion so I used a couple of shallots. 5. 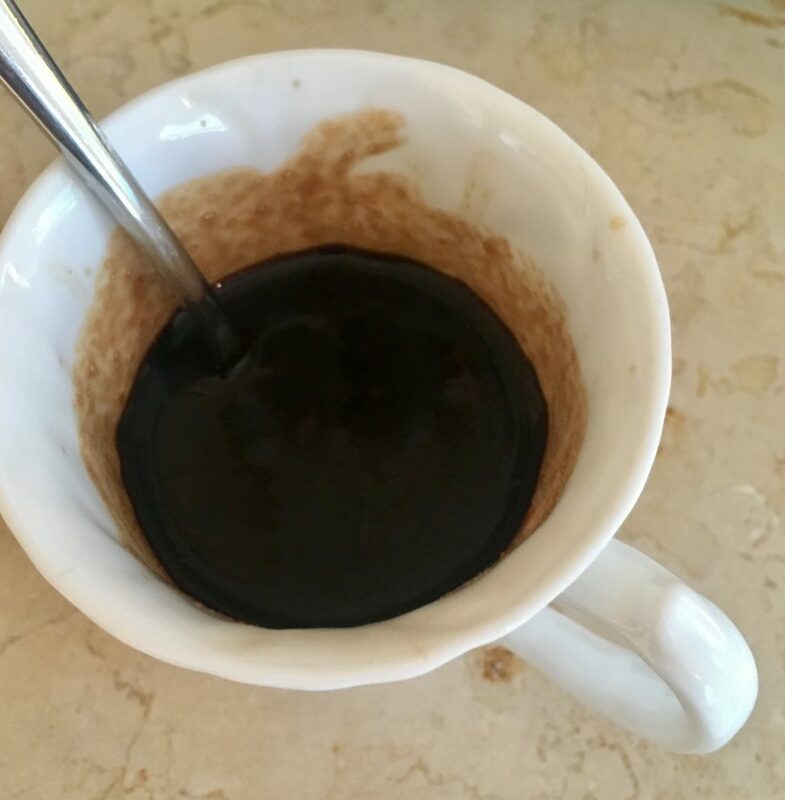 Mix the sauce ingredients together in a bowl and stir well until the sugar has fully dissolved. [This smelled amazing even before I’d cooked it]. 6. Half-fill a medium pan, wok or deep-fryer with vegetable oil and heat to 180°C (350°F), or test using a wooden skewer or chopstick and placing the tip in the oil: if the wood starts to fizz after a second or so, the oil is hot enough. I use a candy thermometer. 7. Using a slotted spoon or a Chinese frying skimmer, first lay the marinated – discard the marinade – pork chop bones in the oil and deep-fry them for 5 minutes. 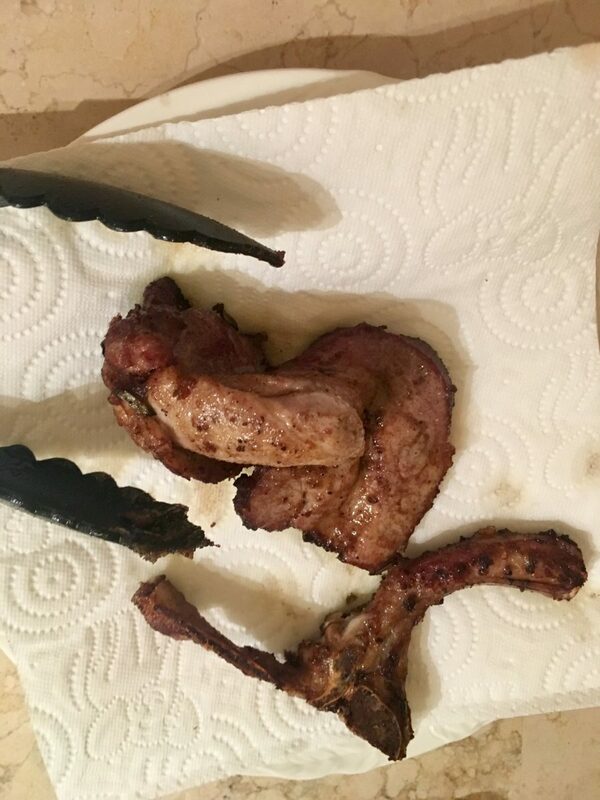 Remove the bones and drain well on kitchen paper, then lay the marinated pieces of pork in the fryer one by one, so they don’t stick together. 10. Heat 1 tablespoon of vegetable oil in a wok to a high heat. Once smoking hot, add the finely sliced red onion and stir-fry for 30 seconds or so. 11. Pour in the sauce and bring to a vigorous boil, then add the bones and the pieces of fried pork meat and toss 2 or 3 times. 1. Don’t worry if you don’t have all of the ingredients. I didn’t have a red onion, Shaoxing wine, black rice vinegar or chiu chow chilli oil so made suitable substitutions, as noted above. 2. I served the dish with plain boiled rice and some vegetables which I’d cooked in more of the delicious sauce. 3. I’ll be honest, I’ve never even heard of chiu chow chilli oil, so looked up a recipe for it (see below) – it sounds awesome – and realised my homemade the chilli and garlic oil, which I use on all sorts of things, would be just fine, this time. 1. Slice the fresh chili peppers thinly. Place into a pestle and mortar along with the salt. Grind and mix thoroughly with the pestle. You don’t need to form a paste, just break down the peppers slightly. 2. Mince the garlic in a food processor or garlic press. 3. Heat 125 ml (½ cup) of your oil in a small saucepan over medium heat. Add the garlic. Stir and let it fry gently for about 30 minutes, until the garlic turns a pale gold. 4. Add the salted chilies, stir and let fry gently for another 5-10 minutes. 5. Next, add the remaining oil to the saucepan to heat through and add chili flakes and sugar. Stir to combine well. 6. Finish off with the soy sauce, and voilà, you’ve got a delicious jar of homemade chiu chow oil! 7. Transfer to a sterile jar and store in the fridge for 2-3 months. However, it sounds so delicious, I bet it doesn’t last that long.